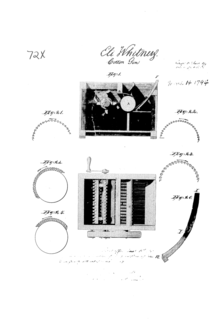 X-Patent number 72, Eli Whitney's cotton gin. The X-Patents are all the patents issued by the United States Patent and Trademark Office from July 1790 (when the first U.S. patent was issued), to July 1836. The actual number is unknown, but the best estimate is 9,957. The records were burned in a fire, in December 1836, while in temporary storage. No copies or rosters were maintained by the government at the time, leaving only the inventors' copies to reconstruct the collection. The Patent Commission of the U.S. was created in 1790. Its first three members were Secretary of State Thomas Jefferson, Secretary of War Henry Knox, and Attorney General Edmund Randolph. On July 31, 1790 inventor Samuel Hopkins of Pittsford, Vermont became the first person to be issued a patent in the United States. His patented invention was an improvement in the "making of Pot Ash by a new apparatus & process." The earliest patent law required that a working model of each invention be produced in miniature. The Patent Law was revised for the first time in 1793. It adopted a simple registration system where a patent would be granted for a $30 fee. The Patent Board was replaced by a clerk in the Department of State. James Madison, Secretary of State, created a separate Patent Office within the State Department and he appointed Dr. William Thornton as its first superintendent in May 1802. The Patent Office 1836 fire occurred on December 15 when the patents were in temporary storage while a new (more fireproof) facility was being built. A fire station was located next to the temporary storage facility, but the hoses and pumps were frozen, and the firemen were unable to prevent the loss. The United States Congress immediately passed a law to aid re-issuing of the missing patents after the fire. About 2,800 such patents have been recovered, and 1,989 are online. Up until five months prior to the fire, U.S. patents had not been numbered, and were identified by titles and dates. The first patent denoted with the serial numbering system still in use today was issued on July 13, 1836, and was given the number 1. The recovered patents are also numbered from 1, but these numbers have an "X" added to them. The X is generally added to the end of the number except for the first patent which has the X in the beginning of the number. Therefore, they are called X-Patents. When an earlier patent was recovered and re-issued, the USPTO sometimes gave it a fractional number (e.g. 2960½X, issued on June 2, 1818; 8736¾X, issued on March 27, 1835) to preserve the correct sequence. Most, but not all, fractional patents are X-Patents. The latest X-Patents were recovered in 2004 from the Dartmouth College archives. Of the 14 found, 10 were granted to Samuel Morey including the first known patent for an internal combustion engine. ^ "Great Patent Fire of 1836". The United States Patent and Trademark Office. Retrieved November 23, 2007. ^ Riordan, Teresa. "Lawyers Unearth Early Patents". New York Times. ^ Riordan, Teresa (August 9, 2004). "Lawyers Unearth Early Patents". New York Times. Archived from the original on May 9, 2013. Retrieved July 18, 2009. “Patent Models’ Strange Odyssey” by Teresa Riordan, The New York Times, February 18, 2002. This page was last edited on 11 November 2018, at 18:33 (UTC).